Donald Cortez Cornelius (September 27, 1936 – February 1, 2012) was an American television show host and producer who was best known as the creator of the nationally syndicated dance and music show Soul Train, which he hosted from 1971 until 1993. Cornelius sold the show to MadVision Entertainment in 2008. Cornelius was born on Chicago's South Side on September 27, 1936, and raised in the Bronzeville neighborhood. After graduating from DuSable High School in 1954, he joined the United States Marine Corps and served 18 months in Korea. He worked at various jobs following his stint in the military, including selling tires, automobiles, and insurance, and as an officer with the Chicago Police Department. He quit his day job to take a three-month broadcasting course in 1966, despite being married with two sons and having only $400 in his bank account. In 1966, he landed a job as an announcer, news reporter and disc jockey on Chicago radio station WVON. Sherman Oaks, Los Angeles, California, U.S.
Donald Cortez Cornelius (September 27, 1936 – February 1, 2012) was an American television show host and producer who was best known as the creator of the nationally syndicated dance and music show Soul Train, which he hosted from 1971 until 1993. Cornelius sold the show to MadVision Entertainment in 2008. Cornelius was born on Chicago's South Side on September 27, 1936, and raised in the Bronzeville neighborhood. After graduating from DuSable High School in 1954, he joined the United States Marine Corps and served 18 months in Korea. He worked at various jobs following his stint in the military, including selling tires, automobiles, and insurance, and as an officer with the Chicago Police Department. He quit his day job to take a three-month broadcasting course in 1966, despite being married with two sons and having only $400 in his bank account. In 1966, he landed a job as an announcer, news reporter and disc jockey on Chicago radio station WVON. Cornelius joined Chicago television station WCIU-TV in 1967 and hosted a news program called A Black's View of the News. In 1970, he launched Soul Train on WCIU-TV as a daily local show. The program entered national syndication and moved to Los Angeles the following year. Eddie Kendricks, Gladys Knight & the Pips, Bobby Hutton and Honey Cone were featured on the national debut episode. Originally a journalist and inspired by the civil rights movement, Cornelius recognized that in the late 1960s there was no television venue in the United States for soul music. He introduced many African-American musicians to a larger audience as a result of their appearances on Soul Train, a program that was both influential among African Americans and popular with a wider audience. As writer, producer, and host of Soul Train, Cornelius was instrumental in offering wider exposure to black musicians such as James Brown, Aretha Franklin, and Michael Jackson, as well as creating opportunities for talented dancers, setting a precedent for popular television dance programs. Cornelius said, "We had a show that kids gravitated to," and Spike Lee described the program as an "urban music time capsule". With the creation of Soul Train, Cornelius was at the helm of a program that showed African Americans in a new light, creating a Black is Beautiful Campaign. Prior to Soul Train, African Americans were only occasionally performing on TV, as guests on white-centered programs. Soul Train showcased African American culture, and brought African American musicians and dancers to television. This show's appeal to white audiences steadily grew and eventually earned a huge following. It was one of the most groundbreaking television shows ever. 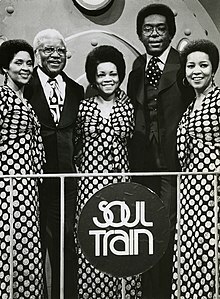 Cornelius (second from right) with The Staple Singers during production of a 1974 episode of Soul Train. Besides his smooth and deep voice and his afro (which slowly shrunk over the years as hairstyle tastes changed), Cornelius was best known for the catchphrase that he used to close the show: "and you can bet your last money, it's all gonna be a stone gas, honey! I'm Don Cornelius, and as always in parting, we wish you love, peace and soul!" After Cornelius's departure, it was shortened to "and as always, we wish you love, peace and soul!" and it was used through the most recent new episodes in 2006. Another introductory phrase which he often used was: "We got another sound comin' out of Philly that's a sure 'nough dilly". He had a small number of film roles, such as record producer Moe Fuzz in 1988's Tapeheads. Cornelius last appeared on the episode of the TV series Unsung featuring Full Force, which was aired two days before his death. On October 17, 2008, Cornelius was arrested at his Los Angeles home on Mulholland Drive on a felony domestic violence charge. He was released on bail. Cornelius appeared in court on November 14, 2008, and was charged with spousal abuse and dissuading a witness from filing a police report. Cornelius appeared in court again on December 4, 2008, and pleaded not guilty of spousal abuse and was banned from going anywhere near his estranged wife, Russian model Victoria Avila-Cornelius (Viktoria Chapman), who had obtained two restraining orders against him. On March 19, 2009, he changed his plea to no contest and was placed on 36 months of probation. In the early morning hours of February 1, 2012, police officers responded to a report of a shooting and found Cornelius on the floor of his home at Mulholland Drive, with an apparent self-inflicted gunshot wound to the head. He was taken to Cedars-Sinai Medical Center, where he was pronounced dead by the Los Angeles County Assistant Chief Coroner. According to former Soul Train host Shemar Moore, Cornelius may have been suffering from the early onset of dementia or Alzheimer's disease, and his health had been in decline. An autopsy found that Cornelius had been suffering from seizures during the last 15 years of his life, a complication of a 21-hour brain operation he underwent in 1982 to correct a congenital deformity in his cerebral arteries. He admitted that he was never quite the same after that surgery, and it was a factor in his decision to retire from hosting Soul Train in 1993. According to his son, Cornelius was in "extreme pain" by the end and said shortly before his death, "I don't know how much longer I can take this." 1 2 3 McKinley Jr., James C. (February 1, 2012), "Don Cornelius, ‘Soul Train’ Creator, Is Dead", The New York Times. Retrieved January 8, 2018. ↑ "1954 Dusable High Yearbook". classmates.com. Retrieved January 8, 2018. ↑ O'Donnell, Maureen. "'Soul Train' creator, South Side native Cornelius dead in suicide", Chicago Sun-Times, February 2, 2012. Retrieved January 8, 2018. ↑ "'Soul Train' host Don Cornelius dead of suicide | wwltv.com New Orleans". Los Angeles, CA, USA: WWL-TV. Associated Press. February 1, 2012. Archived from the original on March 1, 2014. Retrieved January 12, 2016. ↑ "Full Text of HR0190". Illinois General Assembly. Retrieved October 23, 2008. ↑ "WVON History". WVON. Archived from the original on April 30, 2008. Retrieved October 23, 2008. ↑ Eric Deggans (February 1, 2012). "Soul Train creator Don Cornelius made an impact far beyond black America". Tampa Bay Times. Retrieved January 8, 2018. ↑ David Hinckley, "VH1's 'Hippest Trip' reveals how Don Cornelius put 'Soul Train' on the fast track", New York Daily News, February 5, 2010. Retrieved January 8, 2018. 1 2 Brian Stelter (June 17, 2008). "After 38 Years, 'Soul Train' Gets New Owner". The New York Times. Retrieved January 8, 2018. ↑ Hartman Hermene (April 8, 2012). "The Soul Train Impact". HuffPost. Retrieved January 8, 2018. ↑ John Blake; Todd Leopold (February 1, 2012). "How Don Cornelius became the 'pope of soul'". CNN. Retrieved January 8, 2018. ↑ "Why Don Cornelius Matters". NPR. February 1, 2012. Retrieved January 8, 2018. ↑ Molly Hennessy-Fiske (October 19, 2008). "'Soul Train' creator arrested". Los Angeles Times. Retrieved January 8, 2018. ↑ Kot, Greg; Metz, Nina (2012). "'Soul Train' creator Don Cornelius found dead". Chicago Tribune. Retrieved January 8, 2018. ↑ Weiner, David (January 13, 2012). "Shemar Moore: Don Cornelius May Have Had Dementia". ETonline.com. Retrieved January 8, 2018. ↑ "Don Cornelius' Obituary". Last Word. BBC Radio 4. February 10, 2012. ↑ "Don Cornelius Autopsy Report - 'I Don't Know How Long I Can Take This'". TMZ. April 24, 2012. Retrieved January 8, 2018. "Factbox: Key facts about Don Cornelius and 'Soul Train,'" Reuters, Wednesday, February 1, 2012. "TSOP (The Sound of Philadelphia)"